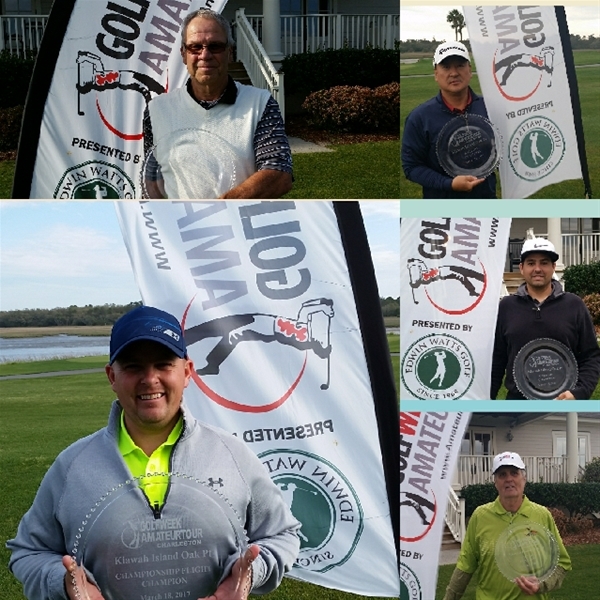 The Charleston tour traveled down Main road for a tournament at Oak Pt at Kiawah Island. The weather was warmer than the previous week but the winds were very brisk. The course has recently undergone a total change to paspalum grass from Tee to green and I can tell you they did it right. The course was in outstanding shape and the greens were spectacular. The Champ flight battled it out from the tips on this windy day Jared Bibbee, John Ashmore and Marty Bunch all shared or had the lead at some point during the day. With two holes to go, John had a two-shot lead but got into trouble on the renovated 17th par 5. His hiccup cost him the lead and then on eighteen Jared sealed the deal with a bogie on the tough finishing hole. The B flight had a real battle going onâ€¦for second place! Randy Tame posted a 38-front side which gave him enough cushion to fend off any challengers. Randy’s 79 was five shots better than the five guys who all posted 84 for a second-place tie. Using our scorecard play-off, Harry Ohms from Columbia took second place, while Jace Gause took home the third-place money. The C flight had to be decided by a playoff on the course as Charlotte’s Charles Mines and Casey Sullivan both fired nice rounds of 86. The playoff went one hole with Casey pouring in a par to secure the Victory. The D flight saw John Wilson post his second straight win with a one-shot victory over Mike Miller. The two came to the tough 18thhole with John leading by 2. John had trouble with on the windy 18th and made a triple Bogie. Mike had a put to tie but it slid by the low side securing the one-shot victory for John.